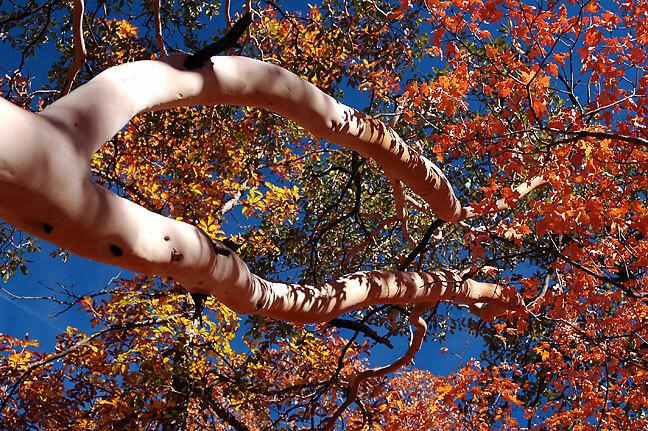 Autumn color decorates the Devil’s Hall trail at Guadalupe Mountains National Park. One key motivation for this trip was to see for myself Rattlesnake Canyon at Carlsbad Caverns National Park, scene of the story of two college students who supposedly got lost there, leading to the death of one of them, in the summer of 1999. Abby and I had both eagerly read the book about the event, Jason Kersten’s “Journal of the Dead,” and after studying the topographic map of the trails at the park couldn’t figure out exactly how anyone could get lost there. 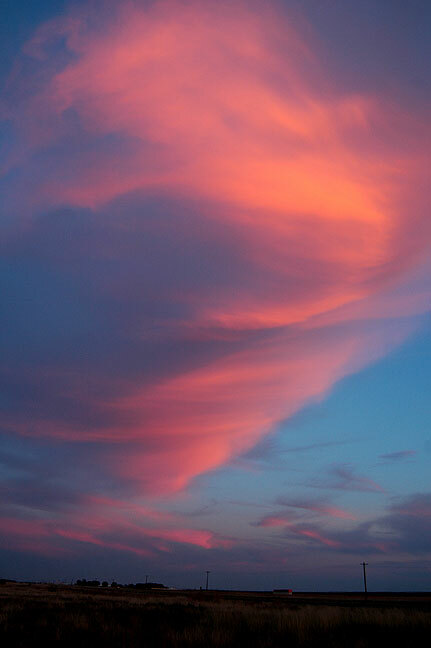 Clouds glow after sunset on the west Texas prairie. I only shot a couple of items at sunset, but I managed to get a huge number of stickers in my shoelaces. Up before dawn on a beautiful day, I was unable to find breakfast or even coffee. Happy restaurant sign, Carlsbad, New Mexico. I was at Carlsbad by 6:45 am, to find that nothing was open, neither the road to the trails nor the visitor’s center. I hiked for some distance on the Old Guano Road trail, making a few passable images. Drove to the Rattlesnake Canyon trail head, where I immediately found the trail to be as poorly marked as any I had hiked in recent memory. Also, unlike the canyons of Utah, these have a certain “sameness” to them. I was especially discouraged by the trail head, which left me guessing and blundering into the wash from anywhere. I could definitely see how someone might get lost. 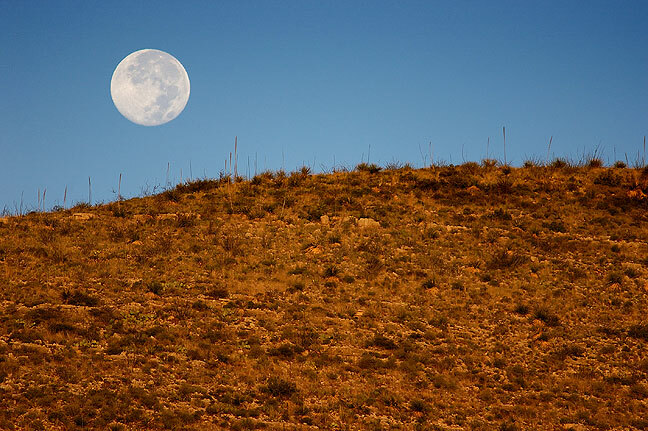 The moon sets on the Old Guano Road trail at Carlsbad Caverns. The descent into Rattlesnake Canyon is bleak and lonely. The side canyon that leads to Rattlesnake Canyon is brushy and indistinct. Rattlesnake Canyon itself is wider, and lined with white limestone where the wash runs. I hiked it in both directions and found some of the landmarks mentioned in “Journal of the Dead.” I concluded that while navigation is something of a challenge in the area, ultimately it would be unlikely that I could get as lost as the hikers in the book did. 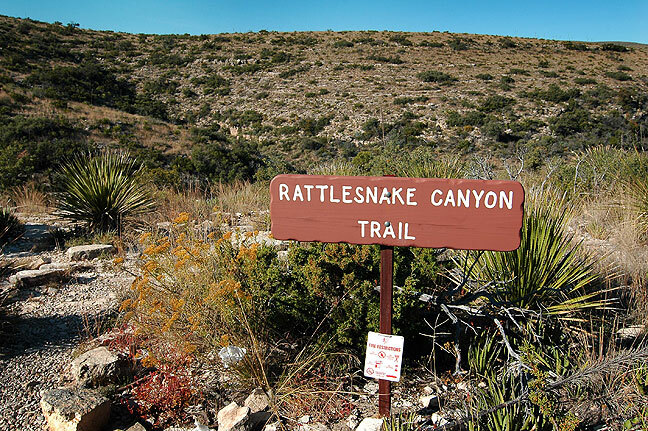 Even if you were unable to find the side canyon that lead back to the parking area, in a pinch you could hike north to another trail, the Guadalupe Ridge Trail, which would then lead you to the road that would take you back to your car or the visitor’s center. And finally, you could hike southeast out of the canyons into the open desert, which places you just five miles west of a major highway. A butterfly lights on a patch of flora in Rattlesnake Canyon. My final conclusion was that you would have to be pretty inexperienced and a very poor navigator to get lost and then trapped in this area. Local law enforcement believed that one of the hikers, Raffi Kodikian, lured his partner, David Coughlin, to the canyon for the expressed purpose of murdering him, and arrested and charged him with that crime. Neither theory fully explains the events, and my visit didn’t really answer any more questions than it asked. Abby and I both recommend the book. This view looks east from a mid-point of my descent of the Tejas trail toward Pine Springs campground. By afternoon I was at nearby Guadalupe Mountains National Park, my second visit to the park, hiking the Devil’s Hall Trail, which was exceptionally beautiful with autumn color. Arriving at Guadalupe today felt somehow like coming home. In all the hiking I did today, I only saw three other people. Autumn foliage clings to Bear Canyon near Hunter Peak at Guadalupe Mountains National Park, Texas. The Bear Canyon trail ascends 2400 feet in half a mile. An exceptional day on the trails, today hiking from the McKittrick Canyon Visitor’s Center on the northern end of Guadalupe Mountains National Park. In the morning I hiked McKittrick Canyon to the Hunter Line Cabin and the Grotto. 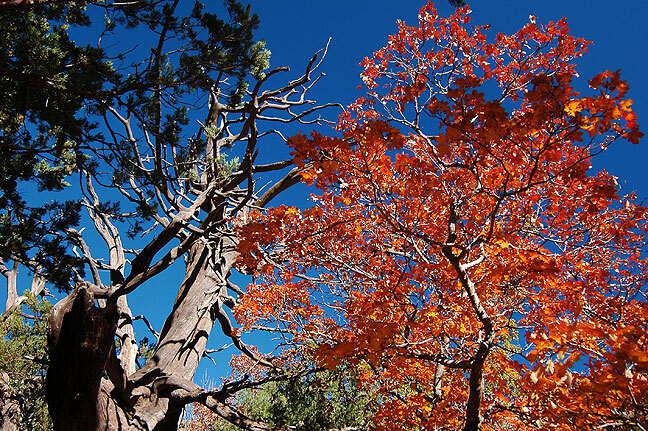 In autumn, McKittrick Canyon is a study in color. This is a fisheye view from The Grotto in McKittrick Canyon. By afternoon, I hiked to the top of the Permian Reef Trail, which was long and steep. Excellent views of the canyon and mountains. 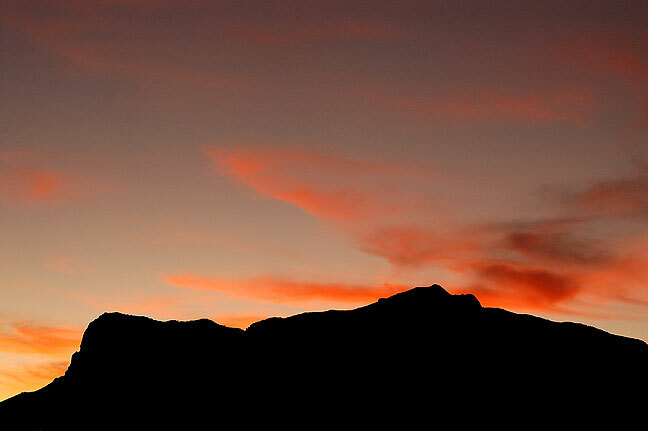 The sky lights up amber hues after sunset on El Capitan and Guadalupe Peak. Hiked one of Guadalupe’s more challenging hikes today, the Bear Canyon/Bowl/Tejas Trail loop, 10.2 miles in about six hours. The first half mile ascends 2500 feet in Bear Canyon. This view on the Tejas trail looks southwest into the heart of the Guadalupe Mountains. A short distance from this viewpoint ascending Bear Canyon, the trail turns left and ascends a steep slope. Desert plants soak up the evening sun on the Tejas trail. Late afternoon light creates a repeating pattern on Guadalupe Ridge. I found this picnic area in need of repair near the New Mexico-Texas border on highway 180. One really neat thing about this image from Hunter Peak is that you can see the trace of the Guadalupe Peak trail on the edge of the mountain on the right. I hiked it in 2003, and found it challenging and fun. This pillar of stone is a short distance from the Permian Reef trail head. This interesting conglomerate natural arch on the Tejas trail does not appear to have a name, at least not one I could find. 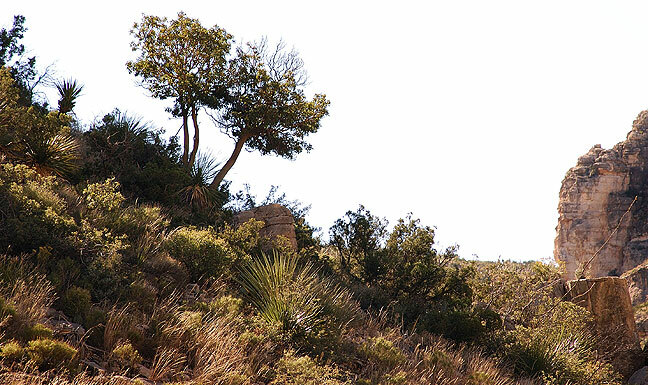 Made from the Permian Reef trail, this image emphasizes the rugged majesty of the Guadalupe Mountains. This view from about halfway up the Permian Reef trail shows McKittrick Creek and the trail that crosses it. Early morning light shines on flora of the Old Guano Road trail at Carlsbad Caverns. 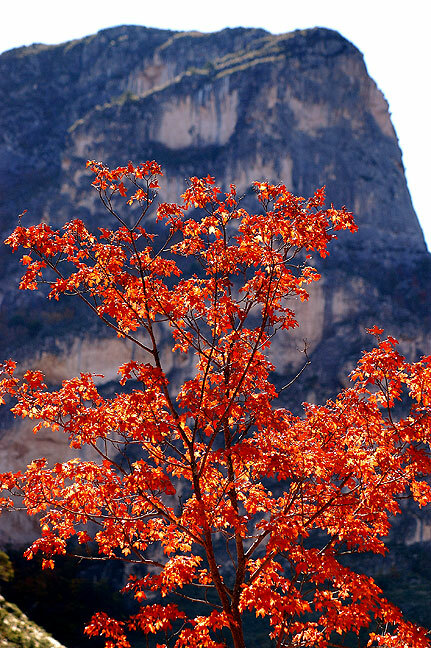 Red autumn foliage trembles against a perfect blue sky along the Bear Canyon trail. Much of Rattlesnake Canyon is surrounded by jagged plant life and rugged terrain. Some features at Carlsbad Caverns National Park; I think the thing on the right looks like it’s about to bite the thing on the left. Bare branches reach for the sky on the Devil’s Hall trail. The sun sets behind Guadalupe Peak, the high point of Texas. November is cotton harvest time in much of the west Texas prairie. An imposing sheer cliff face greets visitors on the Permian Reef trail. Coniferous forest dominates the Bowl trail near Hunter Peak trail at Guadalupe Mountains National Park. The natural entrance to Carlsbad Caverns National Park, New Mexico appears ghostly with condensation. I found this abandoned farm house on my drive through west Texas. Autumn foliage fills the Devil’s Hall trail at Guadalupe Mountains National Park. 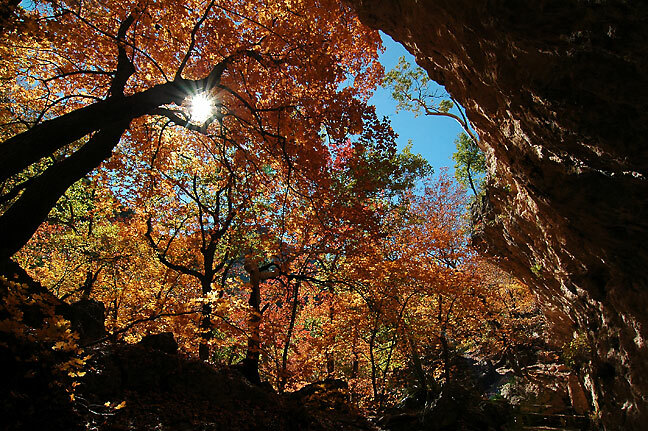 Autumn foliage decorates the Devil’s Hall trail, Guadalupe Mountains. These branches and foliage stretch into the canyon below the Devil’s Hall trail. The Devil’s Hall is one of the garden spots of the Guadalupe Mountains. The Devil’s Hall forms a tall, square passage in the heart of the Guadalupe Mountains. The “hiker’s staircase” on the Devil’s Hall trail is so angular it almost looks manmade. 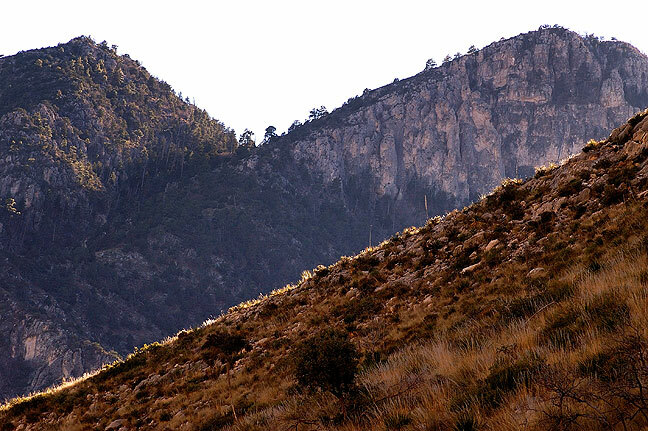 A late afternoon shadow creeps up on cliffs on the Devil’s Hall trail, Guadalupe Mountains. I made this haunting late-afternoon image near the end of my Devil’s Hall hike. The rugged Hunter Peak shines at last light, Guadalupe Mountains. The rolling hills and prairies of west Texas come into view in this image made at last light from the Devil’s Hall trail. A single yucca stands at the El Capitan Peak viewpoint on highway 180 at sunset, Guadalupe Mountains. This view looks south from the El Capitan viewpoint on highway 180. El Capitan Peak glows deep hues at sunset, Guadalupe Mountains. Guadalupe Peak is near the center at the top of this image made from from Hunter Peak. Morning light creates blazing colors on foliage in McKittrick Canyon, Guadalupe Mountains. 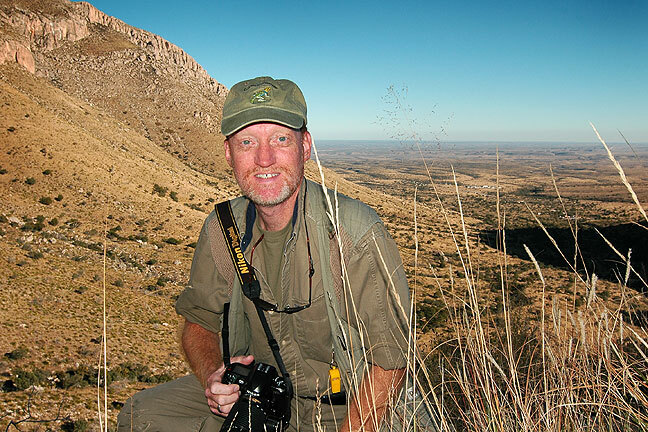 McKittrick Canyon in the Guadalupe Mountains is an open, easy hike. 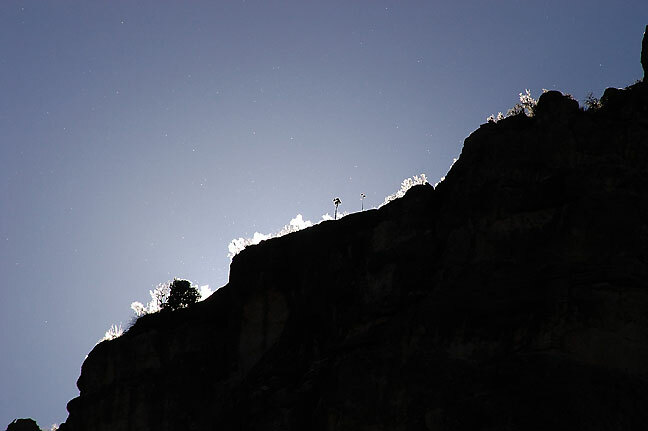 A single stem reaches for cirrus clouds on the Rattlesnake Canyon trail. These trees and a deep blue sky add to the beauty of the Tejas trail. This shot from the Permian Reef trail shows the heart of the Guadalupe Mountains. Grass whips back and forth in high wind, Permian Reef trail, Guadalupe Mountains. The sun sets on west Texas prairie. This view looks south from New Mexico and shows the border signs on highway 180, with the Guadalupe Mountains in the distance.